In 1644 Oliver Cromwell ordered all church organs to be removed from churches and demolished. From then on for many decades or even centuries churches and chapels depended on local players to provide music for their services using a variety of instruments. This thoroughly researched book describes what happened in the churches and chapels of Cornwall in a fascinating account incorporating many humorous anecdotes. The instruments used, the music played and the background of the players themselves are all covered together with references from church and chapel archives and the Author's own experience of playing church band music. Harry Woodhouse was born in St. Austell in 1930 and went from St. Austell Grammar School to Queens' College Cambridge. He spent most of his working life as a manager for English China Clays, and his last job before retirement was to set up their Pacific office in Singapore. An enthusiastic musical amateur, he has played the clarinet with the Cornwall Symphony Orchestra and other Cornish orchestras for over twenty years. With a group of friends, he gives lecture-recitals about the Old Church Gallery Minstrels and is a Bard of the Cornish Gorsedd. Harry studies old musical instmments, making copies of them in his workshop. and plays many instruments including the serpent and the ophicleide. He has made several TV appearances, including a short sequence in the BBC Poldark series. 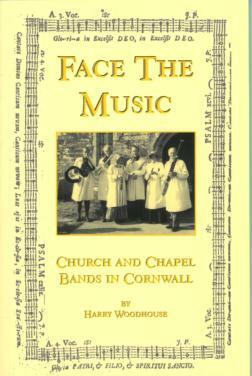 'Face The Music: Church and Chapel Bands in Cornwall', available from the WGMA in paperback, �00, or hardback, �00 (+ P&P), (discounts for WGMA members). Please contact Charlotte Bailey, tel.01962 713392, or email: for postage costs before ordering. On the face of it, Harry Woodhouse's book 'Face The Music: Church and Chapel Bands in Cornwall' does for Cornwall what Canon MacDermott did for Sussex. Indeed, the author refers in his preface to wishing to 'redress the balance' in favour of his home county, but closer inspection of his book reveals a depth and breadth which neither of MacDermott's books could have contained. MacDermott, despite a formal qualification in music, preferred to think of himself as an amateur, an 'antiquarian', as did his contemporary and correspondent, Canon F.W.Galpin. When Galpin first wrote of the church musicians who turned out to play for his wedding in the 1890s, he wrote not as the founding father of British organology, any more than MacDermott wrote as the first authority on church and chapel bands, but as the English country clergyman that he was by profession. To be the first in any field is to be by definition an 'amateur' and though Woodhouse correctly styles himself an amateur, his work has the benefit of having been informed not only by that of MacDermott and Galpin, but also by the work of later 'non-antiquarian' scholars such as Temperley, Dearnley, Blume, and Thurston Dart; that of those other great assiduous amateurs, Lyndesay Langwill and Noel Boston, by later writers such as Rollo Woods, and by Woodhouse's friend in Cornwall, J.C.C.Probert. He is in fact the first in his field, in the way that I have described it above; this is the first book as such to address the specific topic of church and chapel bands in Cornwall. Woodhouse graciously acknowledges John Probert's privately-published monograph, The Worship and Devotion of Cornish Methodism (1978) but, in terms of the subject with which we are concerned, 'Face the Music' vastly exceeds it in scope, producing (for instance) a list which adds to Probert's list of 70 Methodist chapels with specific references to instruments, another 88 from Anglican and (a very few) other churches, a not inconsiderable achievement in a county with a history of Methodist predominance, and one already fairly-well researched. In places, he offers us an avuncular conversational style, (in his preface, he wishes his readers 'a quiet chuckle' at his work) but this honest self-deprecation belies what is a very well-researched and well-produced book, one entirely without deliberate pretension, and in which his occasional refulgence (the author does figure in rather a lot of the book's photographs) is easily indulged. He is that rarest and happiest of all species, the enthusiast, and if and when Woodhouse is carried away, (as into the costs of church vermin control, at one point) it is by his genuine enthusiasm for the topic. In other places his style is all lists and notes. This condenses some of the background and less central material well; his summation of the effects of Cromwell's fury - and the events leading up to it - is efficiently concise. He makes no pretence to literary style, often giving the impression of a 'stream of consciousness' style of writing, but we should not really complain at this when it leaves him scope to regale us, in true antiquarian style, with such anecdotes and digressions as that of his experimental cardboard vamphorn, made for a concert in Truro, which history he ends discreetly with the short sentence 'We shall not do it again.'?. His recording of his minor triumphs is attractive, too. The acquisition of his Ophicleide is a good story, in which appears that essential pre-requisite of all such stories, the (his words) 'long-suffering wife'. What more can one ask of a tale ? Criticisms are few. On occasions, he allows his enthusiasm for the instruments to distract him too far into pure organology, with some of which ( the taxonomy of instruments, for instance) his fellow-members of the Galpin Society would take him to task. The French chaudronnier, Halary, did not make a 'radical re-design of the Serpent' to bring about the Ophicleide, he produced as a routine commission a bass instrument to extend the family of instruments begun by Halliday's Keyed Bugle. The inclusion of a paragraph on the Cornett, far too early and unlikely an instrument to have been found in Cornish church-bands (not the Bb valved Cornet, which was frequently to be found in church bands in the nineteenth century, but the much earlier woodwind instrument, the soprano of the Serpent family) is unnecessary. The statement 'they don't make books like this any more' happens to be true in this instance. 'Face The Music' is printed on good art paper in a more than adequate case-binding, with an elegant and very well-designed dust-wrapper, the kind of book that it is a pleasure to hold. I hope that my copy is the only one where the boardpapers are indifferently glued, allowing the boards to have warped slightly. I should not carp; some of the best of books these days are published in soft covers not destined to outlast the first reading. We should rejoice in any book that, like this one, has seen the inside of a good old-fashioned bindery, and not cavil at having to pay £14.99 for the hardback version. Interesting anecdotes and long-suffering wives apart, there is enough properly-organised reference material, (three tune-book appendices alone) and local colour in 'Face The Music' to keep anyone with an interest in the subject - and any Cornishman at all - dipping in and out of the book for some considerable time, and no respectable 'west gallery' or Cornish local history bookcase will be complete without it.